Apparently I can’t stop making amigurumi animals: I made another one over the weekend. As fiddly as they are, I think they’re so cute and I love gifting them for my friends’ birthdays. There’s one coming up for a Harry Potter fan, so this time I made Hedwig. I used this free pattern; it was a little vague at times, and I had a hard time figuring out what I was supposed to do for the tail feather (at least I think that’s what it is, but the pattern didn’t say), so I just did my best. And I think it came out pretty good! Maybe more like a bird than an owl? Or maybe I’m just too critical. Anyway, I do think it’s adorable and I’m looking forward to sending her to her new home. She can’t be on any of my other social media just yet, so you all are lucky to get the first peek! Guess who finished TWO projects today?? THIS GIRL! That’s right, thanks to the women’s and men’s finals of the Australian Open, I bound off my Boho Baby Blanket today! And even got the ends woven in, how about that? AND! Then after that, I had a sock that was ready for a toe so I zipped through that while catching up on Grey’s Anatomy, and voila, two projects off my WIP list! I do need to block the blanket and take some good photos, but still, I’m down to seven WIPs and I’m committed to working it down further. I really don’t like having so many clamoring for attention. I might have also made a couple more teeny sloths this weekend. Thank goodness they’re fast! Recently one of my work friends had a little mouse issue at his home. It’s happened to me a few times so it didn’t seem like a big deal, but it was his first experience and he was not happy. At all. But he took care of it, and then went on vacation. So of course I had to make a mouse. His name is Marcel and he is now in his new home, hiding among some papers on my friend’s desk. I might add a few chocolate sprinkles for authenticity. The pattern is Pousie Mouse, but I used a slightly bigger hook and yarn than she did. It was very simple, once I found a yarn/hook combo I liked. I’m kind of liking the amigurumi lately! It’s been a busy few days around here. The girl was here for Thanksgiving, which was marvelous, but she also had to work two shifts and see a couple of friends, and then she had to leave a day early to beat today’s blizzard warning, so it was really only three days. And that’s not quite long enough for me. But I enjoyed her while she was here and I am very glad she’s back at school safe and sound. I would have gone nuts thinking about her driving through a blizzard warning! After she left yesterday, I wanted something fun to do to distract me, so I made the boys take me to a cute little nearby town for some retail therapy. I did pretty well! I found this awesome yarn bowl at an art collective and even got a fun tote with it! Hooray for Small Business Saturday! While we were there, I did some knitting on my Hogwarts Cowl at the guitar store and at dinner. I’m halfway through now and like the size much better than my first version. There’s actually been more crochet than knitting this weekend. One of the nephews requested a Pikachu hat and he’s three and very cute so I couldn’t say no. And since I made one nephew a scarf and another a Pikachu hat, I had to make something for the Pokemon-obsessed niece, so I used the last of my yellow yarn for a wee Pikachu for her. They are cute, I will admit it. But that’s enough Pikachu to last me a very long time! I’m taking a break from gift projects today during the blizzard for some selfish knitting…maybe. Or maybe I’ll start a pair of gift socks. In any case, it’s windy and snowing and you will find me on the couch with yarn and dogs for the rest of the day! Everyone else in the path of the storm, stay safe and warm! I have two fun things to show you today! And they’re not even knitted! Remember how my work team went to a glass fusion studio and made mosaic tiles? I finally got mine back! It’s a little more see-through than I expected, don’t know why, but I’m happy enough with it. If I were to redo it, I’d do the letters lower and closer together and maybe use an opaque base instead of clear. But it’s hanging in my craft room and makes me smile. And my other FO is a SUPER CUTE crocheted baby sloth!! I love him so much. He’s a gift for a work friend who loves sloths, but I like him so much I ordered more safety eyes so I can make many more. I want to make ones with long arms that have snaps on the end so he can hang from things too. The pattern is Zippy the Baby Sloth, and it’s free on Ravelry, and took me maybe two hours to make. Now my focus is apparently shifting to gift knitting, as two of the young men in my life would like yarn gifts for Christmas and I am always happy to oblige! What about you, are you deep in gift knitting at this point? I have a friend whose birthday is coming up soon, and I discovered they kind of like dinosaurs. Well. Challenge accepted. I found this cute free pattern for Bert the Dinosaur, pulled out the brown sock yarn I didn’t like for making socks, and cast on in the morning. It was really fiddly to work with six to ten stitches on DPNs, but once it got up to 20ish, it was manageable. And once it started to take shape, I was delighted. Stuffing the tail and neck were tricky, and don’t even ask about the teeny tiny legs! But OMG I’m so happy with my little dinosaur, I kind of want to make more! I didn’t exactly love knitting it, since it was so fiddly and tiny, but it went so fast that I could handle it. Roar!! Seriously? This purple Cascade Magnum is driving me bonkers! Last week I blogged about my challenges finding the right pattern for it, and I really thought I’d figured it out. I even bought the right size needles. Last night I cast on for the Red Rasta Cowl and it was going swimmingly: simple pattern, super bulky yarn, quick progress. The problem is I don’t like it. It’s not the yarn’s fault; I love the yarn and think it’s knitting up beautifully. But it’s so snug and stiff, and it’s already as tall as my neck with another 10 rows to go. It’s not going to drape around my neck the way it looks in the pattern picture. So I have two choices: frog and start over with more stitches and bigger needles, or frog and do the Marian pattern that I know works so well with the Magnum. What would you do? In good news, I did manage to get a couple more projects completed. Remember that blue stripe hat that was too big? I got a new one knit up over the weekend. I even managed to knit in the dark for the first time! It was really fun, actually. 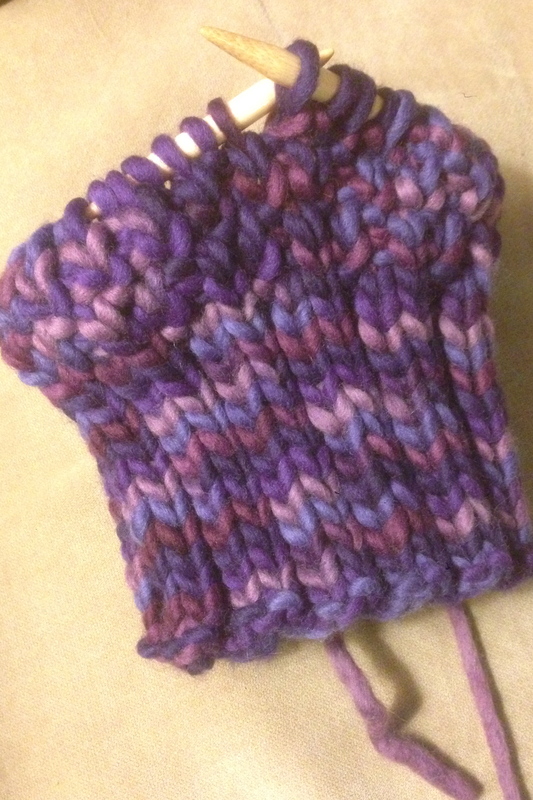 As long as I was just doing simple stockinette in the round, it was easy. Anyway, hooray, that order is complete and I’m sending it off to my SIL for the embroidery. I also finished my most recent travel-knitting project. 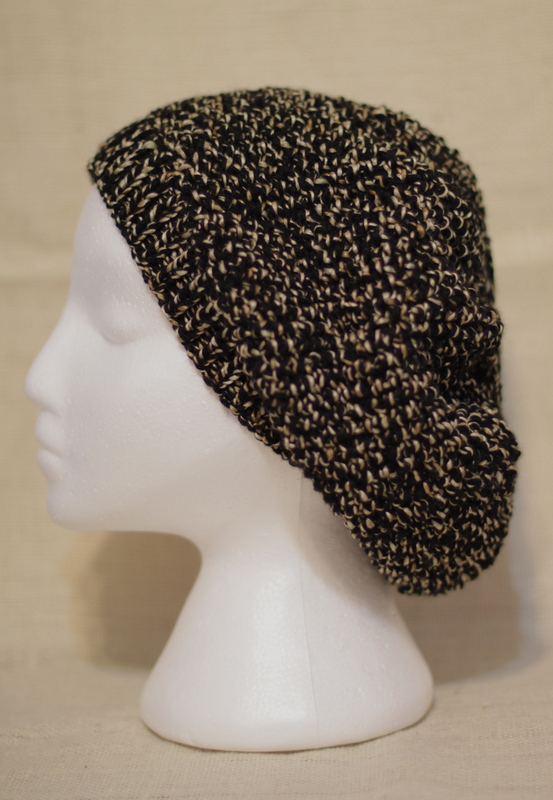 I had a simple seed stitch slouchy beanie going for when I have to sit and wait somewhere, and I thought it would never be done. Yesterday I got close enough that I decided to finish it off at home. 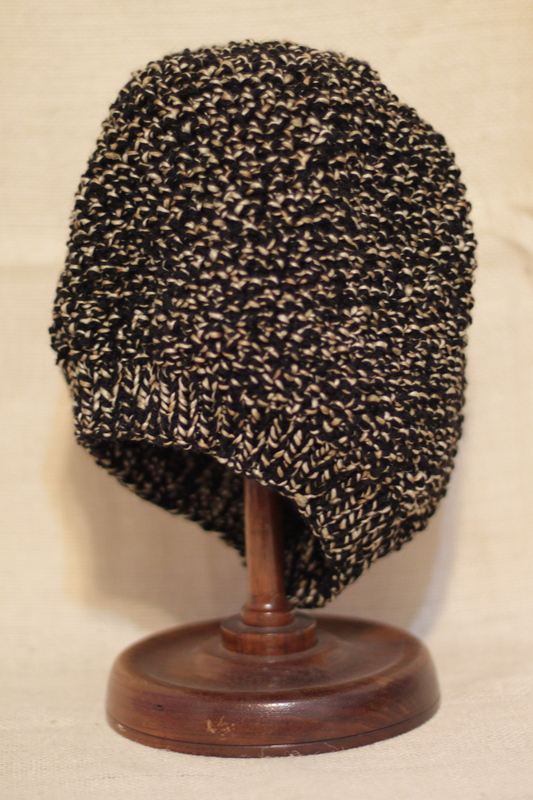 I used the Pompon and Seeds Hat pattern, which has been in my library for ages, and some black and gold Red Heart Fiesta yarn. I think an MU hat will be a hit at my next craft show! If I’d had some solid gold yarn, it would have a pompom. Finally, I thought I’d share my little penguin friend. 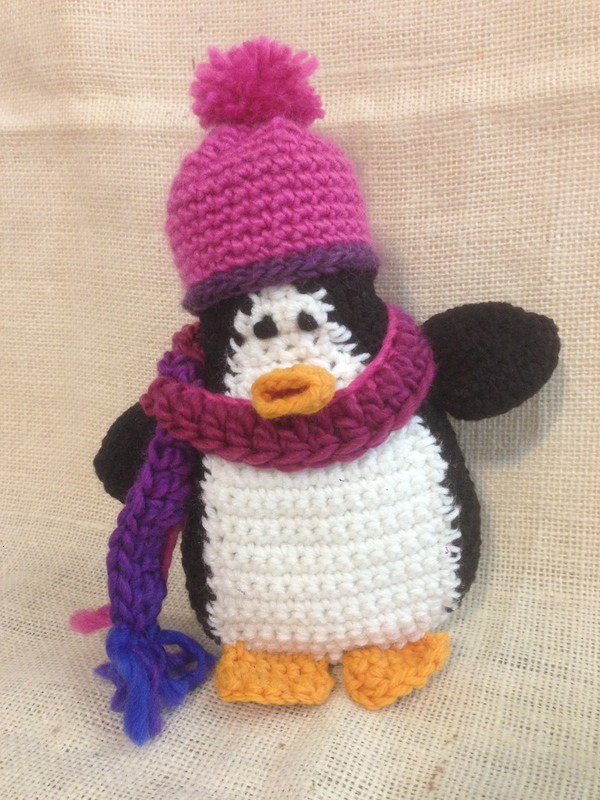 A week or so ago my daughter was a little stressed out from all her activities, so I pulled out a crocheted penguin I’d made last year. I made him a hat and scarf and left him on her bed. She was delighted when she found him and named him Franklin. I’d make more…except I didn’t really like making him! Maybe I’ll look for a knit penguin pattern. Thankfully, she has survived the marching band season and the fall musical. She’s sad to see them end, but we’re all breathing easier to see our schedule open up a little bit. She was a wonderful nun in The Sound of Music, AND this weekend she auditioned for the All-District Band and earned the 9th chair in flute! That means she gets to move on and audition for All-State! Plus, she found out yesterday that she received the highest score on their school chair placement tests. As a freshman, she is the first chair flute at her school! Can you tell I’m a little proud? Today my schedule is empty so I have a date with my couch and my yarn. I have an interesting endeavor that I’m working on, and I can’t wait to tell you about it, but I can’t yet. Maybe if I get a lot of knitting done today, I can share tomorrow!